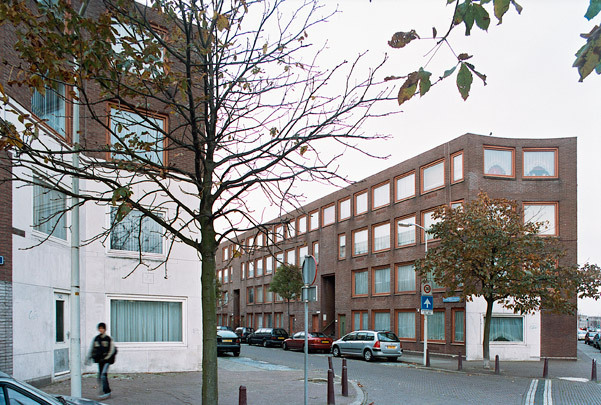 The Portuguese architect Alvaro Siza is responsible for several projects in The Hague's urban redevelopment programme: this housing project, a housing project at the Hoefkade and the redevelopment of the square at the Van der Vennestraat. The two housing blocks, 'Full Stop' and 'Comma', have the most neutral design and continue the Dutch housing tradition (Hague-style porticoes, brick facades and perimeter blocks) pointed up here and there with departures in material and colour. The special floor plans and unusual traffic structure are the fruits of discussions with the blocks' mainly Muslim occupants.